I’ve been a loyal BMW customer over twelve years. Not quite like others in the Active E community, Gerald Belton (Mr. BMW), but we’ve been loyal. There were several years where we had a Honda Civic Hybrid in our garage, but it was surrounded by BMWs. When the California legislature writes laws that allow solo HOV access, I tend to follow them. Regardless of performance, etc. time is valuable and solo HOV access is like gold. I’ve documented our journey to EV ownership the last eighteen (18) months of driving electric as we just passed 42,500 miles. Had we been allowed to, we would have purchased the Active E, but BMW wants the car back. Not one car that I’ve driven has spoken to both myself and my better half as well as our Active E has. 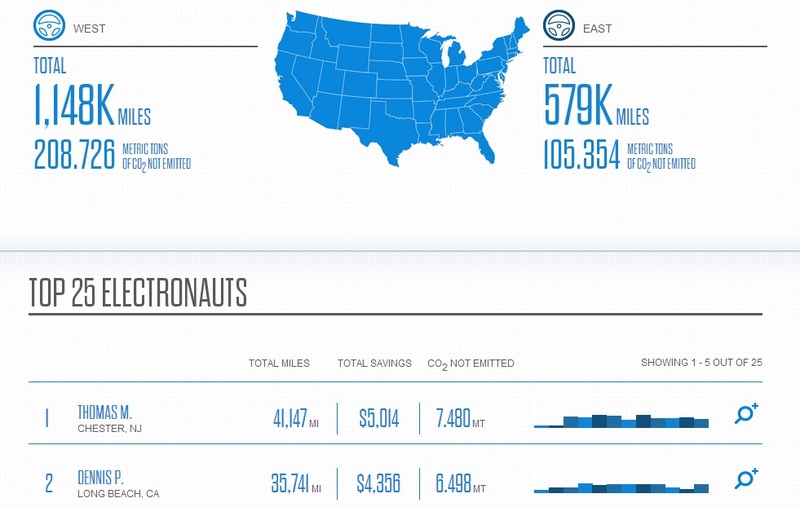 The Model S was the closest for a lot of things, but its price has been hard to swallow. However, if any EV is worth the money Tesla is charging (even with price increases) it is the Model S. After owning one EV, we decided that we will have at least two EVs. We placed a reservation for the Model S last year (after several months with the Active E) and that was what we’ve decided to be one of our two EVs by the time we return our Active E in February 2014. The Model S was designated to be my better half’s car. All was set and we had a plan. We’ve been through the BASE price change and decided to stick with the Model S reservation and not finalize at the beginning of 2013. Furthermore, we’ve been through several accessory price changes, and stuck with the vehicle. This last accessory price change made us re-evaluate a few things that were marginal and decided that we didn’t really need some options, but some of the additional options were of interest, so we were generally pleased with some of the additional options in the new accessory package in the current version of the Design Studio. The Model S is a BIG car as it compares to the Active E and other EVs that we’ve been looking at. After all this time, we finally decided to confirm our Model S reservation last week for a delivery later this year. I have been rooting for the i3, but BMW has had numerous missteps on it. The largest misstep is the aesthetics. It does not look like a BMW to me (and to others). We’ve been lucky enough to have had several BMWs. The design of the i3 has grown on me, so that was a BIG issue that was alleviated for me; however, to swap out the Active E with the i3 was made possible by the fact that we will have a Model S in the garage/driveway for first EV. The i3 will be my daily driver. The devil is in the details, but after the multi-year exposure to the i3, I’ve adjusted to its radically different styling from its ICE brethren. However, the i3 aesthetic is a compromise for me. It would not have been my first choice, but, knowing the drivetrain and battery pack that I’ve been driving is the same one on the i3 as my Active E, with nearly 2000 pounds less, this car will be fun to drive. I’ve already proven that I’m fine with driving 102 mile roundtrips on a daily basis in the Active E. The generosity of Pacific BMW is appreciated as I do my charge around the 51 mile point at a dealership 3/4 of a mile away from my office. And the policy to provide charging for Active E drivers at dealerships that participate in the program at no cost did help me these past 18 months. However, misstep number two was letting me know that the convenience and subsidized charging that I enjoyed in the past will be revoked as the i3 is launched and I will have to budget in a daily charge at the dealership, I am not complaining about this, just have to consider it in my i3 purchase. Nissan and Tesla are offering subsidized charging, at Level 3 at that at several locations/dealerships and this provides the customer with some comfort. Or in my case enough range to really use an 80-100 mile car to its maximum. Specific to my location, the Nissan dealership across the street from Pacific BMW (Glendale Nissan) offers 8 hours of L2 or an hour of CHAdeMO at no cost. Something to consider. Now that there’s a Leaf in the family, I am getting more familiar with the Leaf and see the benefits of the 2013 model. REx as the only option to increase the range from 80-100 miles when there is good “space” to add batteries. Give me the option to pay for additional battery capacity to 150 to 200 miles. Now, I understand that the i3 has a REx with it, optional, but I do not want to drive gasoline if possible. I have a hybrid garage, and do drive ICE at times, but it’s on my choice. I would have enjoyed a LARGER battery pack and range option for the i3, much the same way that Tesla had marketed the Model S with three battery pack options (originally.). The 22 kWh battery pack of the i3 with a 80-100 mile range is fine, for the most part, but I do need to charge to make it work. Additionally, as Tom Moloughney has pointed out (as well as others in the EV community), to ensure long battery life, it is recommended to charge a pack at 80% (or less). If I were to do such a setting on an i3, I would need to have an effective 64-80 mile range. BMW i missed the opportunity abdicated by Tesla Model S when Tesla stopped producing 40 kWh Model S. BMW should have filled in the gap and come out with a 22 kWh and greater (one or two options) battery pack range. Two options at 150 and 200 mile max ranges come to mind. That way we can charge at 80% and get the subsequent 120 to 160 daily range. Is the BMW electric i3 a purpose built EV or PHEV. http://t.co/PCdEyFbLsy Tell us #CarNewsCafe if you agree? I don’t agree, but he does pose an interesting observation in his writings. It would seem that BMW has decided to abandon the BMW Electronaut community. But let’s be serious… If the website is any indication of the reliability of the BMW i brands and the focus that they’re getting, this is unacceptable. I’ve been in the technology field for too long to forgive this sort of outage. Though the Active E program was a test program, a website is not. Additionally, the originally touted Electronaut effect website has gone stale. It does NOT auto update any longer. And it would seem that it, too stopped around the i3 launch. So, why am I pondering a blog name change? Additionally, I’m not convinced that the i3 IS the right vehicle for me, so the blog after February 2014 won’t have an Active E or possibly an i3 to write about. A picture is worth a thousand words… I’ve been so focused on the second EV Active E replacement being a new EV that I will be driving, I didn’t think of getting one for my wife as we’ve already decided that she will drive the Model S when it arrives later in the year. If we flip the switch and get an EV that SHE would prefer over the Model S, and, even used, the Tesla Roadster is such a vehicle. Which means our finalized Model S will be the Active E replacement. Now, there is no guarantee that we “won’t” get an i3 as well. It just makes it more difficult for BMW i to convince me to get one. A CPO is STILL a used car, but Tesla offered a 37 month, 37,000 mile bumper-to-bumper warranty. Guess what, that includes EVERYTHING. AND it doesn’t include a $50 co-pay like our friends at BMW (ICE, not BMW i) had offered on previous vehicles that we’ve had. Our Roadster is a signature one… That means it’s one of the first one hundred issued to customers. It is the 1.5 spec and has some idiosyncrasies specific to that version of the Roadster. 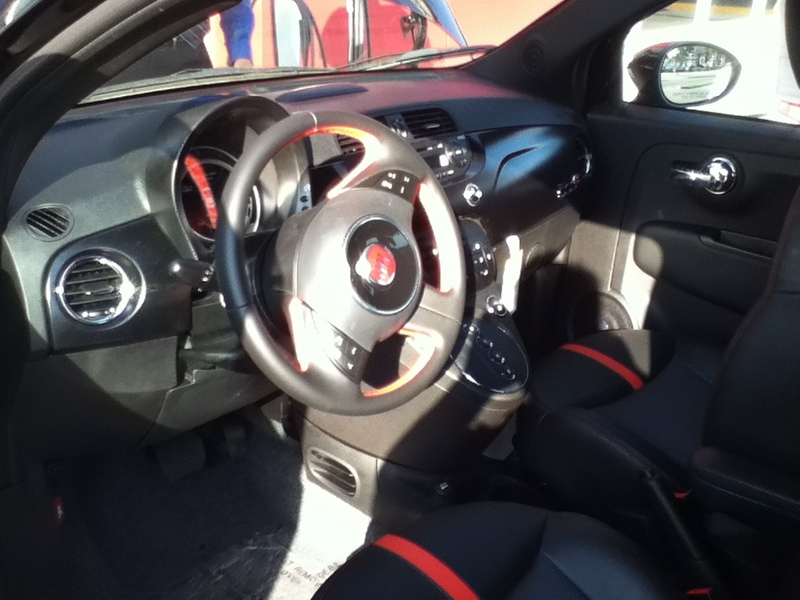 First, 1.5 Roadsters have a shifter, whereas the 2.0 and 2.5 have push button gear shifter. I like having a park setting on the gear shift. The 1.5 that we have doesn’t have one. It’s like a manual car, have to put it in neutral, then pull up the parking brake. Tesla does not have a financing partner readily available as they do for the Model S. The delivery is slow as the product had to be shipped from Fremont and the PDI (pre-delivery inspection) took longer than the first promised date of 19th of August. The picture above was actually taken over a third or fourth revised “promised” date of 24th of August (which would have been poetic, because that is exactly six months until we have to return our Active E to BMW). And since the financing is not integrated to the process, we continue to find ourselves being charged interest on a car that we did not yet “possess”. Granted in the longer scheme of ownership, what’s an extra X days of waiting. However, though the torque is instantaneous in all EVs, waiting for delivery of the order of an already built Tesla does take some time. Our Roadster took a while to get from Fremont to Southern California and we are still waiting a longer time to get through PDI. Patience is a virtue, and boy are we “virtuous”, though losing patience. Here are some pictures from our visit this past Saturday. Ordering a Model S was also without its challenges. I placed my reservation in 2012 with the expectation to finalize the design, etc. in August 2013 based on the delays at the time I gave my initial deposit. I was then approached in February 2013 with a requirement to finalize my order or be subject to the base price increase. We accepted the price increase at that time to delay until August only to find ourselves subject to several accessory price changes. Granted, some of the additional options that were added on were ones that we opted for, it is still somewhat disingenuous to be inconsistent with price increases for those of us who put down a deposit a while back. We will be taking delivery of our Model S sooner than I had originally anticipated. However, with the constant price increases and the fact that if we were to take delivery of the Model S as we return our Active E in February would introduce at least a 14 month delay for receipt of the Federal Tax Rebate vs. a five to six month delay if we took delivery of the car in late 2013. 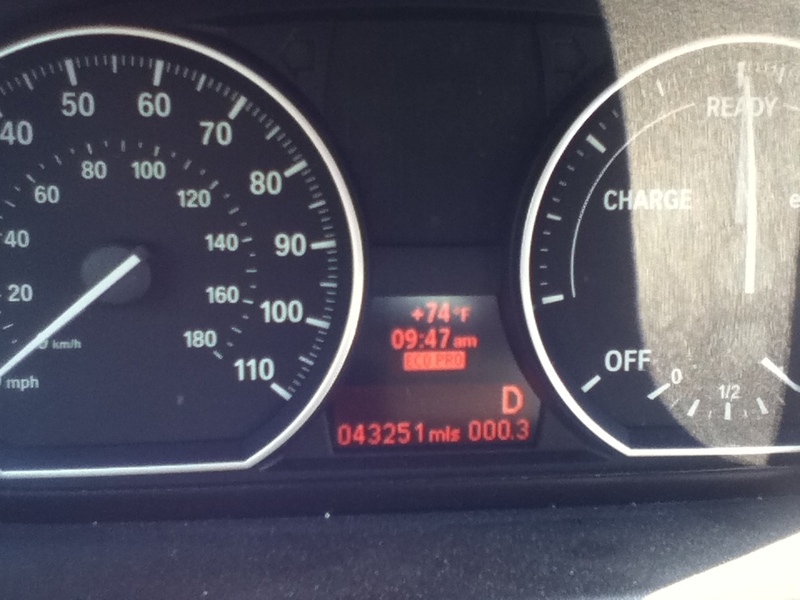 Now the question is, being that I am currently second in the nation for Active E mileage. Do I keep going on the Active E or do I start driving Model S more. I don’t have the answer to that. The “contest” with Tom Moloughney took an unfortunate turn when he got into an accident two weeks ago in Active E #1. No matter what mileage I end up with, if I happen to surpass Tom’s total mileage in in his Active E, the “victory” will be a hollow one. Perhaps I will attempt to come in exactly on the same mileage as his car as an homage to all that Tom has done for the rEVolution and BMW EV fans in particular. That is a lot tougher call to do the match of miles. Or I can honor Tom by taking on the mantle of mileage lead and hold off all challengers. I haven’t decided yet, and will have to wait until our Model S arrives. So, if I start to blog more about my experiences with Tesla Motors… Can I still give my blog by its current title? Should I change the blog title? I am currently unsure and uncertain. Granted, it was still the Active E that made me Environmental… But Tesla seems to be delivering the vehicles that BMW should have provided to me, even five years ago when our “new” Roadster was produced; I would have been such an easy sale for BMW with the Active E.
As an Electric Vehicle enthusiast, there is NO PLACE better to live than California to have early access to and choices in electric vehicles. I was never much of a car guy until my ActiveE. I enjoyed driving and have been quite loyal to Honda and BMW. 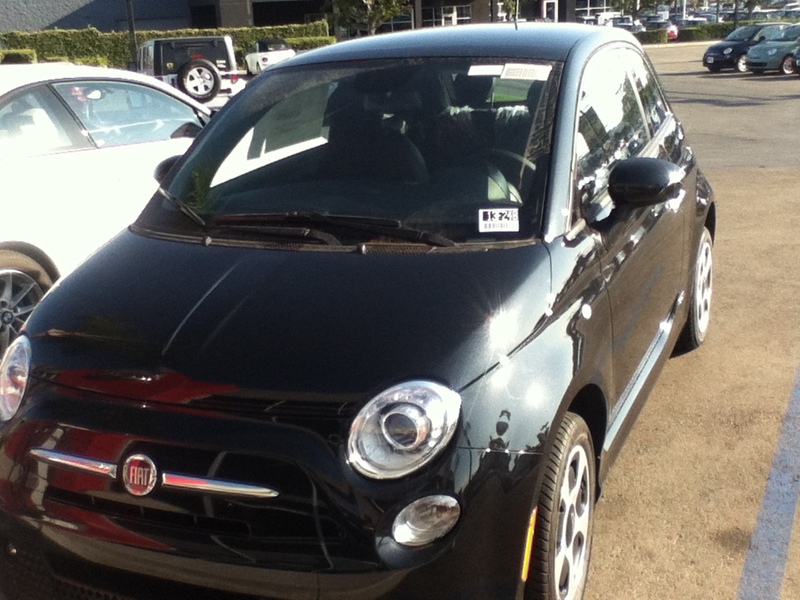 So, it’s rather strange for me to have fallen for the Fiat 500e. But I did. It’s a fun little ride. It’s quick and nimble. I would imagine that it can be driven in LA traffic, weaving in and out of lanes. Needless to say, I was NOT disappointed. 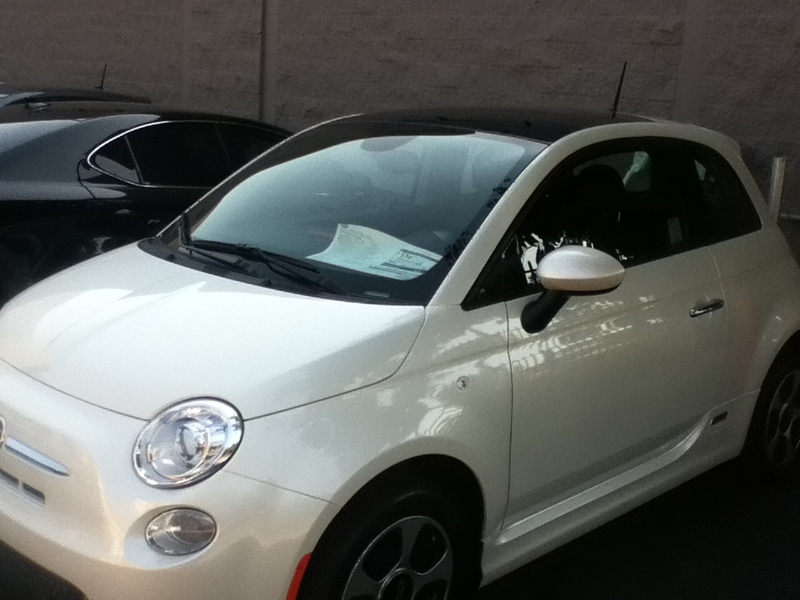 In fact I have so many pictures, let me just refer you to my flickr set on the Fiat 500e. 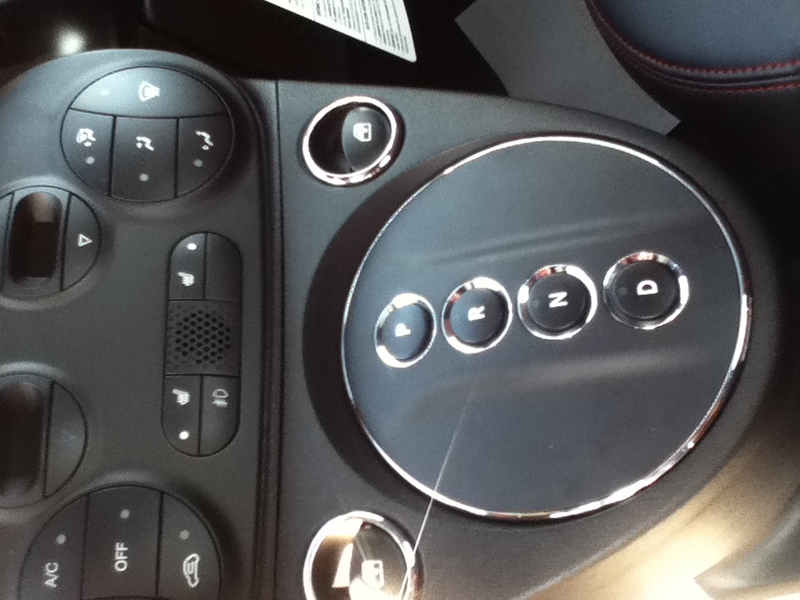 I really liked the push button shifter… Not unlike a Tesla Roadster 2.x. 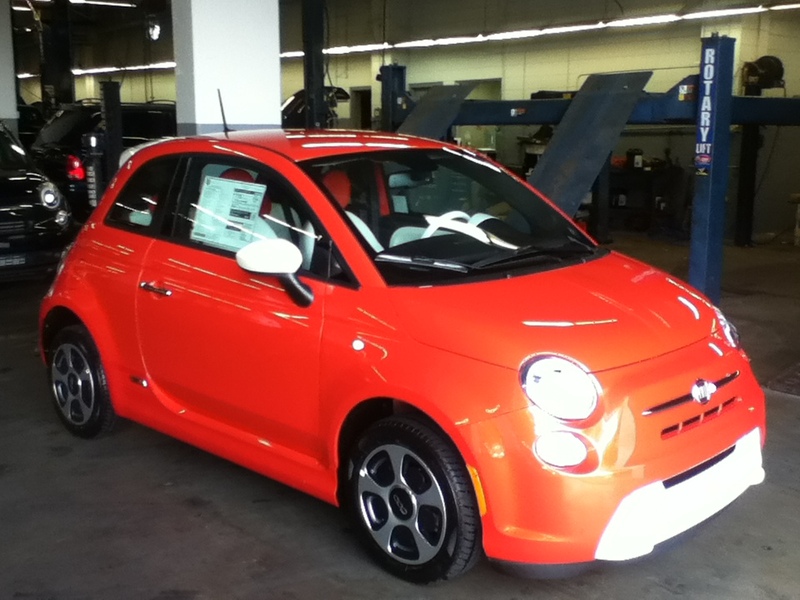 I was lucky enough to try out both of the ones that were delivered to Ontario and one of the ones delivered at Glendale Fiat. So, how did it drive? It was fun. 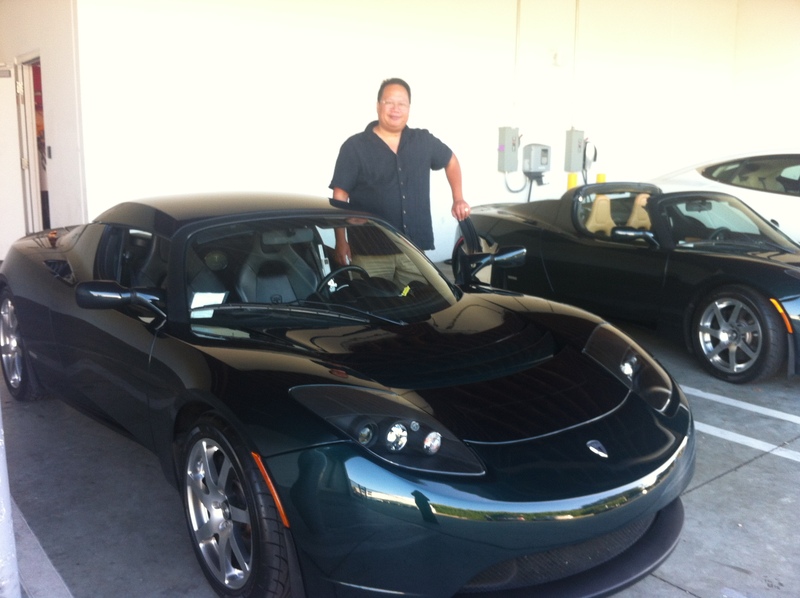 Having had the opportunity to drive multiple EVs is one of the benefits of living in California. 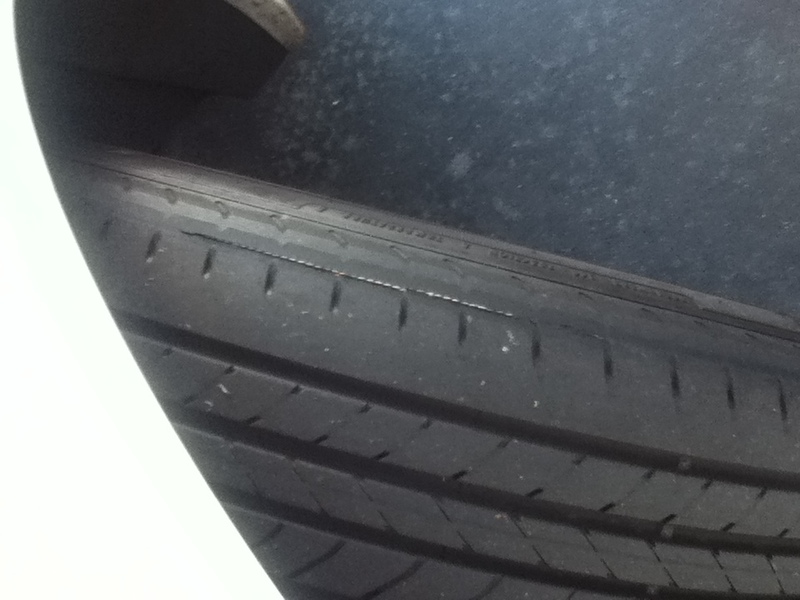 I test drove these vehicles about a month ago and supposedly, dealers were offering $199 lease on them for three years. Not that I ever met a dealer who offered that deal. Apparently, Nikki Gordon-Bloomfield wrote the reasons that this was not so (weeks after I test drove the vehicles) and the demand for this car was so high that thee dealers were just pocketing the incentives. Additionally, it has been my experience SINCE the publication of that article that dealers that did get the car in are selling the cars about $3,000 over MSRP for a “Marketing Adjustment”. Also known as supply and demand when the demand for a vehicle is high. Now, have we found the potential replacement for the ActiveE. I have to say that I was tempted, but each decision for items this large requires that my better half participates (the key to a LONG and HAPPY marriage) and she does not like the aesthetics. In the end, if the price were still at $199 a month, I might have been able to convince her, alas. It wasn’t. So, I had my fun driving the dealerships’ test models and I got to try out a black, white, and orange 500e and they all were fun. I don’t think any of them were kitted out any better (in terms of performance) but the dealership in Ontario gets the kudos for the more interesting route for the test drive. Easy access to the freeways also gives a great test drive for this reviewer as well.